This lampshade was most definitely a labour of love. Now it’s complete I love it, but making it wasn’t an easy experience… but then the reward when I finished it was great! When you know what you’re doing these hand-stitched lampshades aren’t actually as difficult to make as you’d think but when you don’t know what you’re doing (or can’t remember exactly how you learnt what to do as in my case!) it can be quite frustrating. I really wish I had made one straight away after the course at Homemade London but I guess I have learnt a lot from my mistakes and hopefully won’t make them again next time. Before I went on the course I really had no idea how these traditional lampshades were made; I thought each panel was attached separately and I remember hating to remove all the pins I had used to pin the fabric to the frame to get the outline. I breezed through attaching the outer Liberty print fabric and I could do streetly stitch in my sleep now, but I remember from the course the lining was much trickier and easier to get wrong. It’s not perfect but I have now made notes on my notes (!) so I just need to find another frame to practice on before I tackle recovering my big lampshade. I think another trip to a local antique shop is in order! 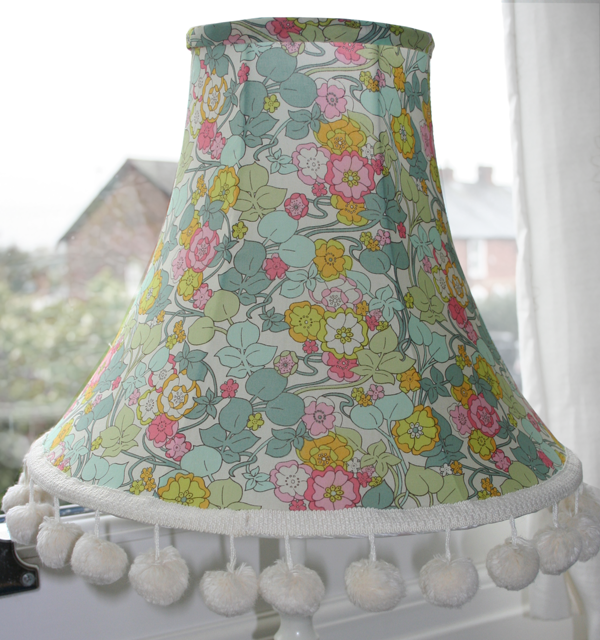 Your new lampshade is lovely – gorgeous fabric and I like the pom-poms! I wanted to drop in to say that I’m sorry I haven’t commented before now – I came to your workshop with Sophie back in February, and meant to comment on your post about the class to say how much I’d enjoyed it, but somehow never got round to it, which was a bit rubbish of me! Anyway, I have just made my first lampshade by myself, and have posted pictures of it (and mentioned you!) on my brand new blog, so I thought I’d let you know. I’m still working out what I’m doing on the blog, but am slowly getting there! Like you, I wished I’d made this lampshade sooner after the class, but I think I’ll remember for next time! (I put my double sided tape onto the PVC rather than the fabric for the seam, so then had to chop into the PVC instead so that I could fold the fabric round – oops). Anyway, I think it’s OK if you don’t look too closely, and I’m sure my next one will be better! I enjoy reading your blog and may be in touch soon about one of your lovely house illustrations! In the meantime, I will try to be a better commenter! Good luck for your class next week! Thank you so much for your comment, it’s lovely to hear how you’ve been getting on since the workshop. Thanks for the mention on your blog, just had a read and it’s great; I really like the fabric you used for your lampshade. I find writing a blog a really good way to keep motivated so keep going! Love San Gimignano too, we stayed there pre-children, in a little house just outside the walls and ate lots of yummy chocolate ice cream and drank lots of amazing chianti! Good luck with your next project, keep in touch! Hi – having just attended my first workshop on making a drum lampshade – I am feeling very proud of myself. However, having looked at your lovely lampshades I thought I would attempt a slightly more challenging shape – but having read your blog – I think I will stick to the ‘drums’ for the moment. Am really interested though how you get the ‘shape’ ones to work and what you mean by hand-sewing. Looking for some lovely lampshades to sell on my kids website akidslife.co.uk. I learnt how to make the hand-stitched ones on a 2 day course – there is a lot more work that goes into them as the fabric is stretched onto the frame and pinned. The fabric is then marked and stitched together and pulled over the frame and stitched to the rings by hand. It’s hard to explain but I love them too, it’s become a bit of an obsession! Thanks for your comment, your website looks great by the way!